We were allotted cells, three men to a cell that normally held one man. I was in B block on the third floor (top floor) with a fellow called Harper-Ball (Major) and one called Hoot Gibson. Harper-Ball was a manager of a rubber plantation and Gibson, who was a very cultured and gentle man, owned a palm-oil plantation in Johore Baru. The cell was about 9 feet by 12 feet with a concrete block for a bed in the middle. We tossed a coin for which position we were to use. Gibson won the block in the middle and we slept either side. The European wardens managed to take over the kitchen and slept in the cells above a smart move on their part. I envied their luck, as nearer to food more chance of survival. This photo taken in 1945 after Liberation, is from the State Library of Victoria, Australia. It is part of the Argus Newspaper Photograph Collection . (Image H98.103/3942). We managed to settle in and get organized. At first the old colonials thought they still had their servants etc. and tried to treat the boys as such. 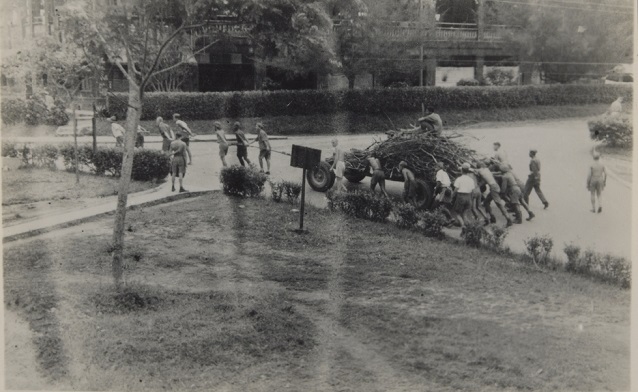 However the Japs gave the order, no work - no food, so they had to change very quickly. As there were quite a few who could only do light work or none at all, we agreed to pool everything. Those on the heavy work details, myself, got slightly more than the others as they needed it. 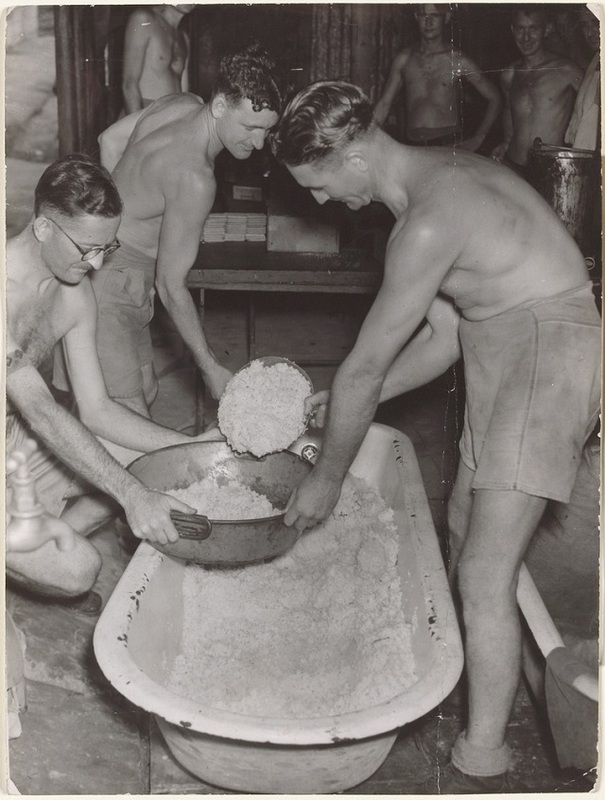 We were served three meals a day consisting of breakfast which was rice boiled sloppy like porridge, nothing in it. Lunch, steamed rice and watery soup made of anything they could find. Dinner, steamed rice (1 cup) and maybe sardines (6 - 8 men per little tin) or corned beef spread to about 8 or more men, hardly filling. There were many different jobs to do. The main one gardening to plant tapioca and sweet potato to add to the rations also anything that could be made edible. It took very hard work to break up the soil for planting; the ground was not meant for cultivation. Also we went out with homemade wagons (part of old trucks) which took about 8 men to pull them to collect grass etc. for compost heaps. We were also sent logging to cut down trees to work the boilers etc. in the kitchen, which had been converted from oil. This photo, dated to around 1945, is from the State Library of Victoria, Australia. It is part of the Argus Newspaper Photograph Collection . (Image H98.103/3870). This photo taken in 1942 is from the State Library of Victoria, Australia. It is part of the Major Arthur A. Moon Collection. (Image H97.254/9). There were many clever men in the camp who made sandals from old tyres, as our shoes were worn out. They also made us briefs from old shirts just to keep us respectable. In the case of many other things, there was always somebody who could make it. On the logging trips the Japs decided we were not allowed to cut the trees down, but had to dig them out by the roots. As there were about twenty men all working at the same time on different trees it was rather dangerous. One day we were ready to drop a big tree, so we shouted warnings for everybody to clear the area, then we cut it loose. As it was dropping we noticed one of the guards had walked into the area where the tree would fall. Down went the tree on top of him. I was sure we had killed him--then as the tree settled on the ground a little head appeared through the branches and we knew he still lived. He was a bit dirty and in an untidy state and in a very bad mood, but we found it very funny. This photo taken in 1945 after Liberation, is from the State Library of Victoria, Australia. It is part of the Argus Newspaper Photograph Collection . (Image H98.103/3684). Going on working parties we saw quite a few of the locals working their gardens etc., but not being able to speak their language I could not communicate with them. So I asked Gibson to teach me to speak Malay which he was pleased to do. In a matter of about six weeks I was fairly fluent. I could speak to the guards who spoke Malay and also some Sikhs that helped as guards with Japs. 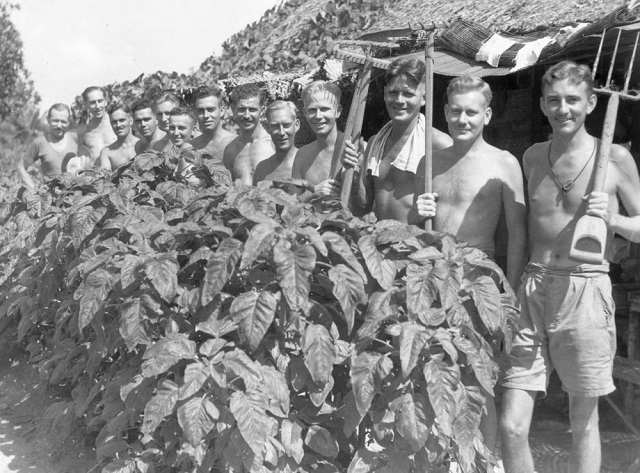 When the Japs were not looking I could speak to the locals who gave me information and sometimes hid fruit for me to pick up and hide. I also managed to do a few deals for food etc.--small but handy. 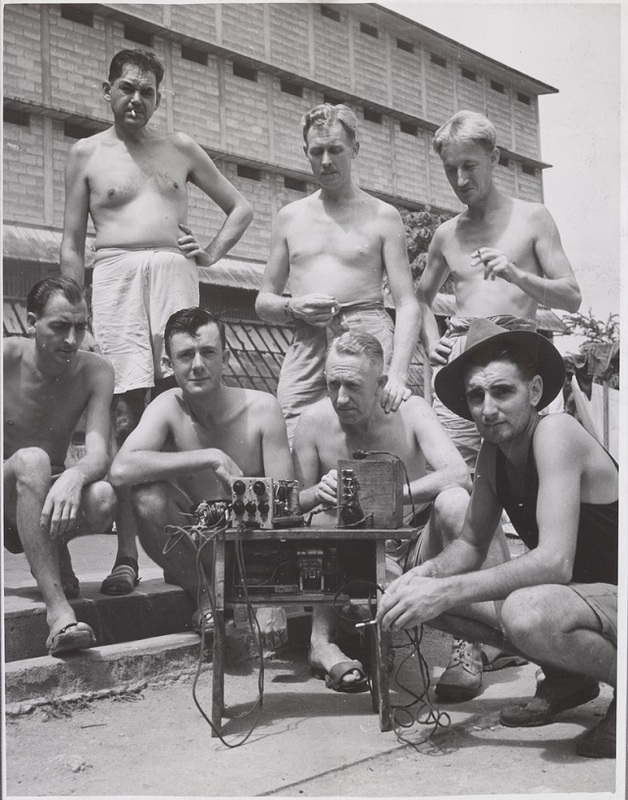 We managed to get news of the outside world as some fellows had smuggled in a couple of radios. One was hidden in a little wooden stool and another under a manhole cover in the yard. News was bad. This photo taken in 1945 after Liberation, is from the State Library of Victoria, Australia. It is part of the Argus Newspaper Photograph Collection . (Image H98.103/3698). Christmas 1942 came and went. We put on shows for entertainment so we had some amusement. Being one of the youngest I was asked with a friend to play the part of girls, in one show and do the Can-Can as per the Montmarte. The woman's camp lent us a couple of skirts and we used two halves of coconut shells as busts along with a cotton top. We put turbans on our hair and when you looked at us we looked like girls. We did out part and were a great success, as we had a captive audience of over three thousand. We were waiting back stage when two Jap officers came along and started talking to us. I explained we spoke a little Malay. They started fussing as it was obvious they thought we were girls, so we kidded them along and asked for cigarettes, which they gave each of us a packet. (English from Red Cross parcels). We said we had to leave but would come back later. Out of sight we took off laughing our heads off. At least we had got some cigarettes. We never received a Red Cross parcel all the time I was a captive, but the Japs were always smoking English cigarettes. 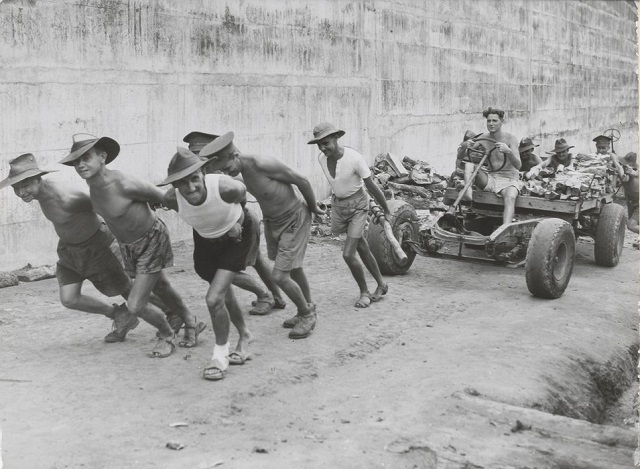 This photo which was taken circa 1943, is from the Australian War Memorial website. (ID# P01433.010). Sometimes the guards got drunk and came into the prison slashing at us with their bayonets and chasing us down the hallways. Some got hurt if they were not fast enough. One morning at about five o'clock we were called from out cells and told to muster in the main yard. When we got there, there were Japs everywhere, many in civilian clothes. It was not hard to realize they must be OGPU, Jap Gestapo. They started to search the cells and if they found anything incriminating even a piece of wire or anything suspicious your name was called and you were interrogated. This went on all day--we had no food or anything. Finally they finished the search and took away I understand about 200 prisoners. I believe they were taken to the YMCA for interrogation as that was their headquarters and torture area. They found the radios and some of the men were executed. We never saw most of the people they took away, but about six months later and over a period of time, several fellows were sent back in coffins. You could see they had been tortured, but were still alive so we took them to our hospital and fortunately were able to revive them. I managed with friends to get Harper-Ball (my cell mate) elected camp commandant, so we moved from our cell to a bigger area in one of the hallways. We were now theoretically "big shots", and had a chance of more perks. A new Jap interpreter came to the camp and used to spend time with us he was very friendly and brought us food and cigarettes. He spoke with an American accent and told us he was from Hawaii. He was not happy about the war and did not believe in it and wished he was home. He was like us, just wanted to go home. He must have been too friendly, as he was moved away. We missed his generosity. Through my new contacts I managed to get a job as rice cook in the kitchen. I started work at 5:00 am to cook rice in the big boilers. Rotten job but good for extra food. This photo taken in 1945 after Liberation, is from the State Library of Victoria, Australia. It is part of the Argus Newspaper Photograph Collection . (Image H98.103/3876). Many more people were being put in the prison with us from all different places. Captured seamen, Norwegians, Greeks and a large Jewish contingent from the bazaars. We had now over five thousand inmates of forty plus nationalities. Time went slowly at times, but going on working parties outside the prison helped. Our days were occupied, and in the evenings we played cards. I learnt to play bridge and about two months later a tournament was played. My partner and I entered and it was really funny when we won. Many people thought of escaping but although we could get out of the prison reasonably easy to get across the straits would be difficult and then there were thousands of miles of the worst possible jungle to travel through and you did not know which natives were collaborators. There were spies in the camp and you had to be very careful. Things were getting tighter in the camp and the Japs stopped our shows. Constant patrols were checking on us, when they passed us we had to stand to attention and bow, if they were not satisfied that you showed sufficient respect, they would slap you across your head and you had to continue to bow. Like I mentioned before being a prisoner was no joke. While in Changi Prison, Bill was given this document by the Director of Medical Services for the Straits Settlements. The Director, R.B. 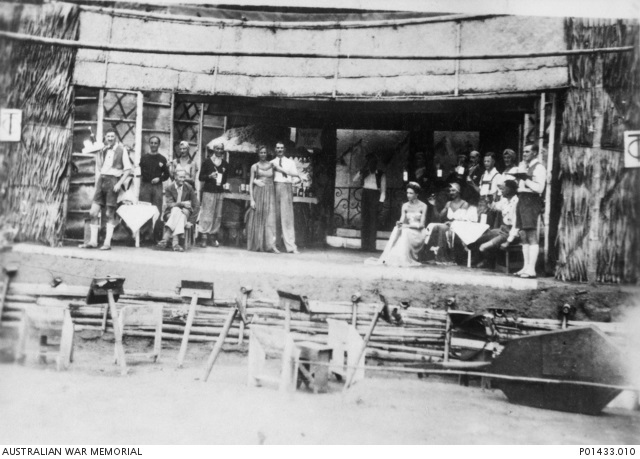 MacGregor was grateful to Bill and the other Asia crew members for their gallant service in the General Hospital during the siege. This little piece of paper meant a great deal to Bill and was the only documentation which Bill ever had giving his whereabouts during the war. It was a regular occurrence for their Kamikaze pilots to some round to look at us all dressed in white with black boots with Japanese writing on them. One day a batch of high ranking officers came to tour the camp (I heard one was a Prince). When they came near us we had to stand to attention and boss as they passed, one officer was further back than the group and when he had passed by my pal muttered "the little yellow bastards". The Jap stopped and walked back to us and said to my pal in perfect English "it is lucky we do not speak English". My pal went deathly white. I am sure he thought he would be executed, but the Jap walked on laughing. There are many tales I could tell of the things we did to get food and the risks we took. The hardest thing was not knowing how long our incarceration was going to last. Our accommodation deteriorated as the prison became alive with bugs, they were everywhere in the walls in our clothing the sacks we used for sleeping on, at night they were all over us biting away. In one cell we got a blow torch and burnt over every inch of the walls and ceiling then we whitewashed it. This we felt would be the cure. Two days later it was just as infested--we had wasted our time. 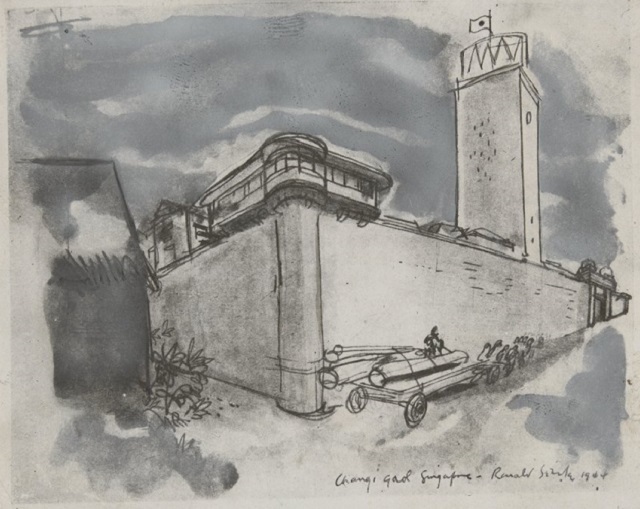 British cartoonist Ronald Searle (1920-2011) was serving in Singapore with the Royal Engineers when the city fell to the Japanese. 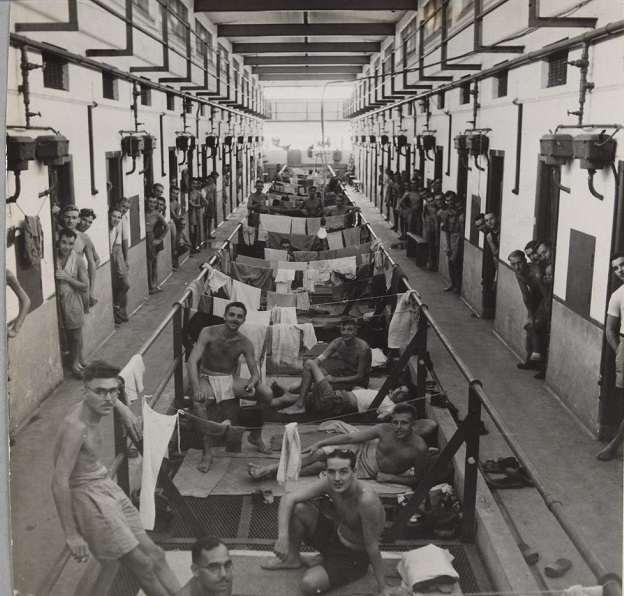 He survived four years of brutal treatment as a PoW, including time on the Burma-Siam Death Railway and his incarceration in Changi. This photograph of his original sketch is from the State Library of Victoria, Australia. It is part of the Argus Newspaper Photograph Collection . (Image H98.103/3957).